There'll be fireworks on the Memphis riverfront (around 10 pm at Mud Island River Park) and in cities all across America. 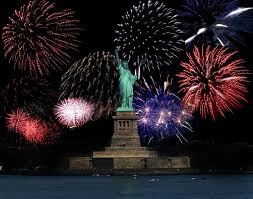 But this year eyes will focus particularly on on New York harbor - Lady Libery will re-open! Sandy flooded the 12-acre island on which the statue stands with surges as high as 8 feet, but Lady Liberty was spared. Hundreds of National Park Service workers from all over America spent weeks cleaning mud and debris, plus numerous other recovery efforts. The statue was dedicated in 1886 and welcomes about 3.5 million visitors.